In this report, we describe the challenges facing the corporate income tax and discuss two structural reform options that could address them. One option would seek international agreement on how to allocate income of multinational corporations among countries. The other option would eliminate the corporate income tax, but would tax American shareholders of publicly traded companies at ordinary income tax rates on their dividends and accrued capital gains. We discuss the benefits and limitations of each option. The first option, known as formulary apportionment, would require countries to agree to a system of carving up the worldwide profits of multinational corporations according to some combination of payroll, property and sales occurring in each country. This is how U.S. states divide up interstate profits, but there is no agreement on standards or any indication that the system works well. Over time, states have moved towards a single sales factor and added “throw back” rules and other complexities, resulting in high compliance costs and very little corporate tax revenue. The second option gets at the root of the problem, the corporate income tax itself, its inherent distortions and the inability to track profits accurately across borders. The solution proposed is to eliminate the corporate income tax and instead increase shareholder taxes. This makes tremendous sense, except for the part about taxing capital gains on an accrual basis, using market valuation, rather than on a realization basis. The authors discuss the various problems with taxing accrued capital gains, including that it a) depends on accurate market valuation at a single point in time, b) could force liquidation or otherwise bankrupt investors without sufficient cash on hand to pay the tax, and c) takes no account of inflation which means investors can end up paying extremely high rates on real capital gains. But the other big problem with accrual based capital gains taxation is it discourages investment, because it literally taxes current investments. In contrast, realization based capital gains taxation taxes the sale of investments, and to the extent that money is used for consumption it is a tax on consumption. It is true, as the authors point out, that taxing capital gains realizations at excessively high rates can “lock in” low-return investments and prevent the efficient movement of capital to higher return investments. However, that is reason to keep tax rates low, not to switch to accrual based taxation. Lastly, the authors claim that accrual based taxation of capital gains is necessary to pay for some of the lost tax revenue from eliminating the corporate income tax. They assume the entire amount of corporate income tax collections ($357 billion) would be lost, and then they unrealistically assume that eliminating corporate income tax would have no impact on investment or GDP and thus no offsetting impact on the other sources of federal tax revenue, such as personal income tax and payroll. That is, they are using a static analysis that ignores any economic effects. 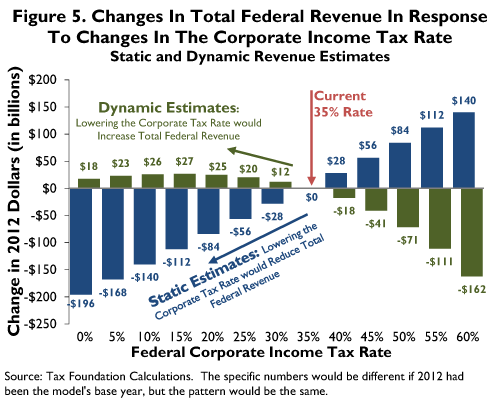 Our model takes these economic effects into account (it is dynamic), and we find eliminating the corporate income tax would boost GDP and personal incomes about 2 percent, and since most federal tax revenue is from taxing wages and personal income, such a change would actually increase total federal tax revenue by about $18 billion. See the chart below and read the study here. The bottom line is there is no need to pay for eliminating the corporate income tax, and certainly not by taxing capital gains on an accrual basis. The corporate income tax is distortive, uncompetitive and increasingly unworkable in the age of globalization. As a result the rest of the world is steadily getting away from taxing corporate income. We should too.